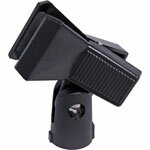 Adapts a single mic stand head to three mounting points. eg. May be used to mount three microphones on a single mic stand. 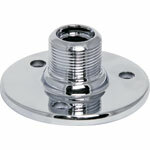 Standard 5/8" thread. Useful for recording in stereo. 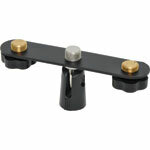 Standard type mic holder, uses 5/8" thread to enable direct fitting to most mic stands and goosenecks. 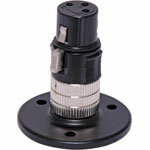 Designed to suit narrow bodied hard wired mics. 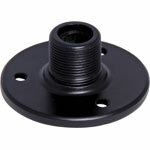 Uses standard 5/8" thread to enable direct fitting to most mic stands and goosenecks. 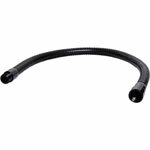 Features flexible plastic to allow the accommodation of a variety of microphone sizes. 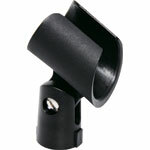 Spring loaded mic holder, uses 5/8" thread to enable direct fitting to most mic stands and goosenecks. 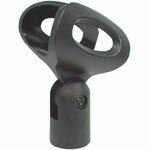 Microphone gooseneck incorporating 5/8" thread male to female. 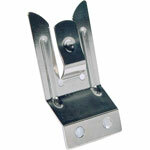 Matching bench mount bases C 0420/21. 300mm Chrome. 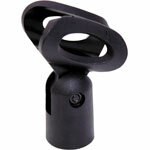 Microphone gooseneck incorporating 5/8" thread male to female. Matching bench mount bases C 0420/21. 300mm Black. Microphone gooseneck incorporating 5/8" thread male to female. Matching bench mount bases C 0420/21. 450mm Chrome. 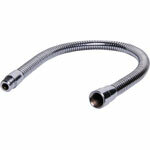 Microphone gooseneck incorporating 5/8" thread male to female. Matching bench mount bases C 0420/21. 450mm Black. 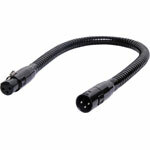 Incorporates a 3 pin XLR socket for mounting gooseneck microphones. 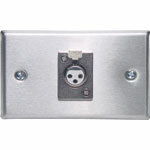 Screws directly to a desk or bench top making a neat and simple installation. Black.